The purpose of this section of the Website is to present some houses from the seventeenth, eighteenth, and nineteenth centuries and thus to give a sense of the residences of Hawthorne's world. Some of these houses have specific connections with Hawthorne; others are featured because of their architectural importance and to offer a sense of Salem during the time Hawthorne lived there. The subtopics in this section are: Houses Where Hawthorne Lived, The Turner-Ingersoll House, aka "The House of the Seven Gables," the Robert Manning House, and Other Salem Houses). 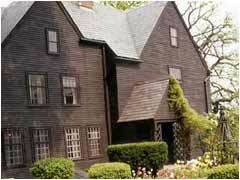 Salem is renown for its many handsome homes which date back to the mid-seventeenth century. In addition to outstanding examples of "First Period" (c. 1626-1715) architecture, Salem is particularly noted for its houses of the Federal era (c. 1780-c. 1830). It also boasts a number of important Victorian (c. 1830-c. 1910) houses as well. The earliest houses in Salem, built when the first settlers arrived in 1626, exist only in replica form in Pioneer Village, constructed in 1930 off Lafayette Street on Salem Harbor. Salem does, however, have two mid-seventeenth century houses, the Pickering House (c. 1651) and the Retire Becket house (c. 1655). Other seventeenth century houses, such as the John Ward house (sometime after 1684), the Hooper-Hathaway house (c, 1682), the Jonathan Corwin (c. 1675) house, and the Turner-Ingersoll house, aka "The House of the Seven Gables," also stand today, and all are open to visitors. The eighteenth century was a time of prosperity in Salem, and the city experienced extensive building during this time. From c. 1720-c. 1780, houses were built in the Georgian style. The Crowninshield-Bentley House (c. 1727-1730) is one of the best examples of this style. Later in the eighteenth century, after the Revolutionary War, and into the nineteenth century, Salem enjoyed enormous prosperity from its maritime trade. It is during this period that the stately houses in the Federal style were constructed, and many of them survive today. Samuel McIntire (1757-1811), who lived and worked in Salem, was the architect and carver for many of these homes. The best place to observe the stately homes of the Federal period in Salem is Chestnut Street, called by many scholars of American architecture, the most beautiful residential street in the world. Some examples of the early Federal period style in Salem houses are: the Peirce-Nichols house (1782, 1801), the Simon Forrester house (c. 1790/01), the Joshua Ward house (c. 1784-1788), the Benjamin Hawkes house (1780; 1801), and the Joseph Felt house (1794/95). Examples of the mid-Federal period, a style more delicate and refined than early Federal architecture, are: the Gardner-Pingree house (1804-05), and the Cook-Oliver house (1802-03). Although Samuel McIntire died in 1811, his Adamesque Federal style prevailed in Salem architecture until c. 1835. Some of the best examples of this style in residences are seen in the Forrester-Peabody house (c. 1818/19) and the Dodge-Shreve house (1822-1825). As maritime trade declined and was replaced by an industrial economy, fewer houses were built in Salem. There are, for example, few examples of high style Greek Revival architecture though there are some fine examples of its influence in the porches of Chestnut Street residences with their Ionic and Corinthian columns. The Italian Revival style is in evidence in the bracketing added to Colonial, Federal, or Greek Revival houses in Salem in the latter part of the nineteenth century. Examples are the Bertram-Waters house (1855; 1888-89; 1911-1912) and the John Tucker Daland house (1851-52). The Italian Revival style was popular throughout the country in the decade preceding the Civil War. The Second Empire style rarely appeared in Salem until after 1870. With its characteristic mansard roof, examples of this style can be seen today on Lafayette, upper Essex, and upper Federal streets.